The Philadelphia 76ers played on St. Patrick’s Day, but that didn’t stop forward Mike Scott from celebrating. 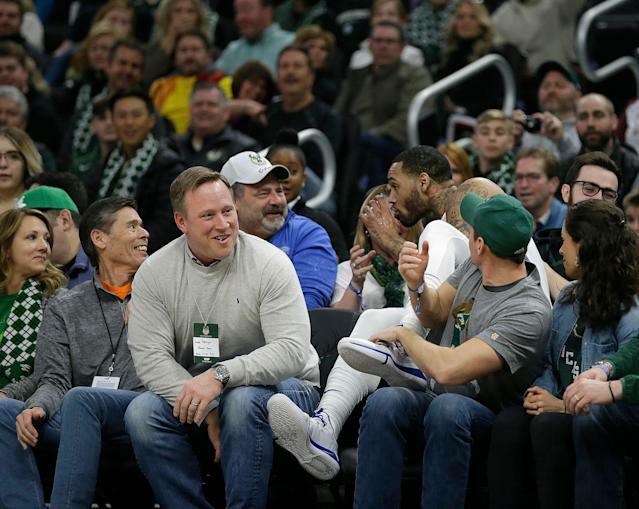 Late in the first quarter of Sunday’s 130-125 win over the Milwaukee Bucks, Boban Marjonovic’s missed jumper was tipped toward the sideline, and Scott jumped two rows into the stands to save it. T.J. McConnell came up with the ball and drove into the paint for a short jumper, so Scott aptly celebrated his assist by grabbing a fan’s beer and pretending to drink from it. Scott isn’t the first player to pretend to drink a beer during a game. During Game 1 of his Cleveland Cavaliers’ second-round series against the Toronto Raptors in 2017, LeBron James grabbed a beer from a waitress and faked taking a sip. That being said, he didn’t commit to the bit as well as Scott did. Still, this move is sure to endear himself to the Philadelphia fans. Scott was acquired at the trade deadline in the deal that landed Tobias Harris from the Los Angeles Clippers. He’s averaging 8.1 points in 23.9 minutes per game for the Sixers on 40.8 percent shooting from beyond the arc. While other players may not be as ready to party as Scott is, there’s a long line of players who have got into the crowd and taken fans’ food. Dallas Cowboys receiver Terrell Owens famously celebrated a touchdown catch by dumping popcorn all over himself, while then-Houston Rockets point guard Kyle Lowry actually snacked on some popcorn after getting fouled. Similarly, James ate a fan’s french fry after converting an and-one during his first stint with the Cavs. Baseball players love getting in on the action as well when chasing foul balls. Although Prince Fielder couldn’t come up with a pop-up in 2013, the first baseman consoled himself with some of a fan’s nachos. Meanwhile, Milwaukee Brewers shortstop Orlando Arcia nabbed a spoonful of ice cream when a fan was looking away. And then there’s Mark Sanchez. Although he didn’t take food from fans, he’s a rabid in-game eater, chowing down on everything from a hotdog as the starting quarterback for the New York Jets to a chicken finger as a backup for the Philadelphia Eagles.